Pure Body Teacher Training Beginning with Foundations and spanning the entire Pilates repertoire, our teacher training is a classical Pilates program that includes some of the best contemporary variations informed by applicable medical and scientific research and advances. Each exercise includes the classical teaching, contemporary variations, regressions, progressions, modifications and how to teach someone with various pathologies and tactile cueing teachings. Reading list Return to Life and Your Health by Joseph Pilates are required texts. Titles written by Blandine Calais-Germain, especially Anatomy of Movement, are a helpful supplement. The Anatomy Trail Guide is a valuable anatomy text and can assist a beginner teacher in recognizing and recruiting particular muscles and muscle groups (but is not required). The Pilates Method Alliance study guide is helpful as you get closer to taking your PMA CPT exam, but is also not required. Our students are qualified to sit for the Pilates Method Alliance, Certified Pilates Teacher exam upon completion of our full program. After passing that exam, you will be a PMA Certified Pilates Teacher. We deliver quality programming to a select group of passionate students. The full program spans a year but can be broken up in smaller portions, taking longer than a year to complete. The cost of our program is $6300. Space is extremely limited, so payment is required to hold your spot. The cost of your manuals is included. Payment plans are available. Our payment plan starts with $750 to reserve your space and $750 on the first of each of the following eight months. 2. Leave the start date 9/1 and scroll to the bottom of the page, click to agree and then “make purchase”. 3. Create an account or sign in to an existing account and simply follow the prompts. 4. $750 will be charged on your card to register for the program and then $750 will be billed to your card on the first of each of the following eight months. 5. Look on the Teacher Training tab, scroll down to your corresponding course and enroll in that course. If you have any trouble registering this way, simply add a credit card to your account details (once logged in > account), email community@purebodyteachertraining.com and we can set it up. We would love to answer your questions. Please email us directly, community@purebodyteachertraining.com. This module covers important aspects of the full comprehensive course including the history of Pilates, topical anatomy, common pathologies, professionalism and ethics in the Pilates industry, working with a study group, and details about the apprentice program. Most importantly, the six building blocks to all Pilates exercises are learned in Foundations, giving our students a strong sense of the basic shapes found in the Pilates repertoire. 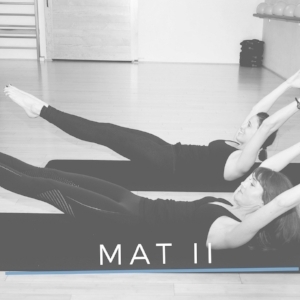 Mat I is an eighteen hour module covering the beginner and some intermediate mat exercises. The text for this module is Return To Life by Joseph Pilates. We also require the study of Your Health by Joseph Pilates. We cover mat exercises, pre-Pilates, Pilates breathing, the magic circle, hand weights and the "TV Exercises". Mat II is an eighteen hour module covering the remaining intermediate and all of the advanced mat Pilates exercises. Like the mat modules, Reformer I, II and III cover all of the exercises most commonly taught on the reformer from beginner (module I), to intermediate (module II) and advanced (module III). We will consider all of the classical exercises, some of the historical and some of the archival exercises, jump board and dozens of safe contemporary variations. Apparatus I, II and III cover beginner, intermediate and advanced exercises and theories on the cadillac, chair, spine corrector, ladder barrel and ped-o-pul. Some experience on these pieces of apparatus is expected.